TEMECULA, CA--(Marketwire - August 12, 2008) - The results are in and South Coast Winery, this year's winner of the prestigious California Golden State Winery of the Year award, is capturing the attention from both international and national wine buyers and critics across the nation for its wine quality, value, and selection. From vine to shelf, South Coast Winery has always placed quality ahead of quantity. With 41 of its wines earning 255 awards and medals from both regional and international wine competitions in 2008 alone, there is little doubt in anybody's mind that South Coast Winery is committed to producing quality wines and adhering to quality production methods. As owner/vintner, Jim Carter, summarizes it, "We started with great passion and commitment to making the finest wines possible here at our winery. As you can see, the efforts of our winemakers Jon McPherson and Javier Flores have really been paying off in the amount of medals that we are winning, including the additional stature of having earned the California Winery of the Year medal. But, our commitment is still to produce the finest wines possible, which we now know are already in the bottles awaiting release next year." It has always been the vision of owner Jim Carter to create the finest vineyards that would produce the greatest wines, however, that's not all Carter found himself particularly good at. The resort side of the South Coast enterprise completes the wine country experience and has earned high rankings on the internet's top travel sites, including Expedia and Trip Advisor. "The blending of nature, fine wine, fine food, and elegant comforts, presented to guests with gracious hospitality" is taken from the organization's Vision Statement. 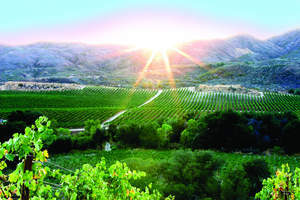 Says Carter, "South Coast Winery understands the important role it plays in helping raise the level of awareness in the domestic and international circles about the high quality wines being produced in the Southern California Temecula Valley Wine Region and takes this job seriously." South Coast Winery produces a broad portfolio of premium wines that are 100% grown and produced with care under his tutelage in Southern California's up and coming Temecula Valley Wine Country. Over the course of the first five years of its production, the winery has received over 600 awards and medals from both regional and international wine competitions. The winery graces the grounds of South Coast Winery Resort & Spa, a 38-acre destination property located in the heart of Temecula's Wine Country at 34843 Rancho California Road, Temecula, California and also has a wine-country themed restaurant and tasting room in the heart of Orange County California, and both can be found online at www.southcoastwinery.com. For more information about this release, electronic photos or to schedule a private media tour of South Coast Winery Resort & Spa, contact Crystal Magon at (951) 587-9463 Ext. 7204 or cmagon@wineresort.com. 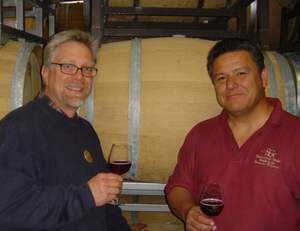 Those Interested in wine distribution opportunities should contact Brenda Ruocco at (951) 587-9463 Ext. 724 or bruocco@wineresort.com.